(CNN) -- Japan is grappling with its worst economic crisis since the end of World War II, the nation's economic and fiscal policy minister said Monday. 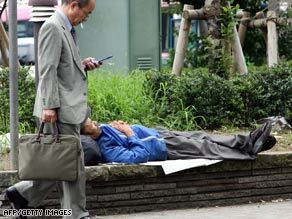 A businessman walks past a homeless man taking a nap at a Tokyo park. The comments from Kaoru Yosano followed news of Japan's gross domestic product falling 12.7 percent in the fourth quarter in 2008. "This is the worst economic crisis in the post-war era," Yosano said at a press conference, according to Japan's Kyodo news agency. The global economic crisis has pummeled Japan, which depends largely on its auto and electronics exports. The slump in exports has led to tens of thousands of layoffs across Japan. "Behind [the contraction in GDP for] the October-December quarter is a terrific downturn in exports," he said, according to Kyodo. "Like other major countries, our country cannot avoid the pains of structural change," Yosano said. To stimulate the economy, the Japanese parliament needs to act quickly on key budget measures, he said, referring to bills related to a second supplementary budget for fiscal 2008 and early passage of the state budget for fiscal 2009. Asked about Japan possibly producing a new economic stimulus plan in the short term, Yosano said wide-ranging discussions would be needed first. "After seeing this level [of GDP], it is our duty to think of various policy options," he added.